This Chocolate Marble Bundt Cake marks the last Bake Along. I recalled how excited I was when Zoe invited me to join in this event and bake along with the rest. I also remember I had lots of problem doing the linkage and Joyce would always help me at the backend. Thanks for all these wonderful experiences. I really learn a lot of things from you, Ladies. Thanks for all your hearts and efforts in organizing it. (1)Heat the oven to 180C. 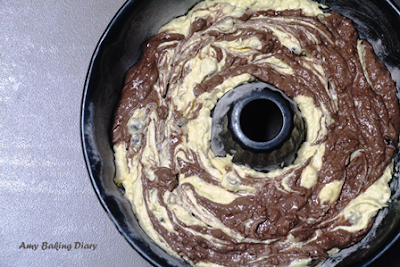 Thoroughly brush a 1.5 litre bundt tin with melted butter. (2)Cream the butter and sugar together until light and fluffy. Stir in the almond extract. (3)Mix together the baking powder, flour and ground almonds. Beat in one egg at a time, adding a spoonful of the flour mixture in between. Repeat until all three eggs have been added, then fold in the remaining flour mixture and stir in the milk. (4)Spoon half of the cake batter into a separate bowl and mix in the cocoa paste. Add the chocolate chips to the other half of the mixture. Add spoonfuls of each of the batters alternately to the tin and drag the handle of a teaspoon through the mixture to create a marbled effect. (5)Bake for around 40 minutes and then test the cake to see if a skewer inserted into the deepest part comes out clean. The cake will take 40 - 50 mins, depending on the proportions of your bundt tin. (6)Let the cake cool in the tin for 10 minutes before turning out onto a cooling rack. Once cooled, dust the cake with a little icing sugar. Your bundt cake looks very nice and delicious. 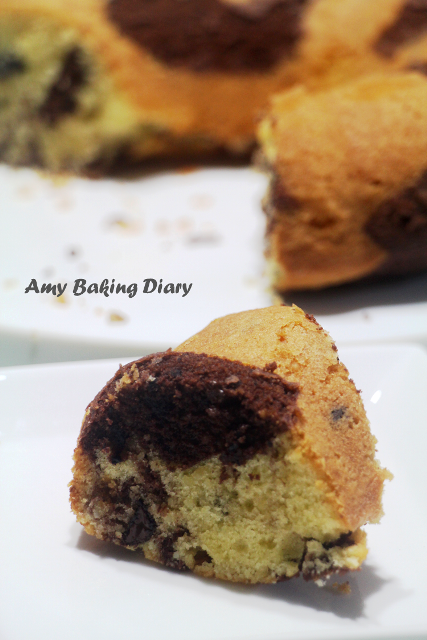 It has been awhile since I last had any marble cakes. Thank you for your constant support in Bake-Along. 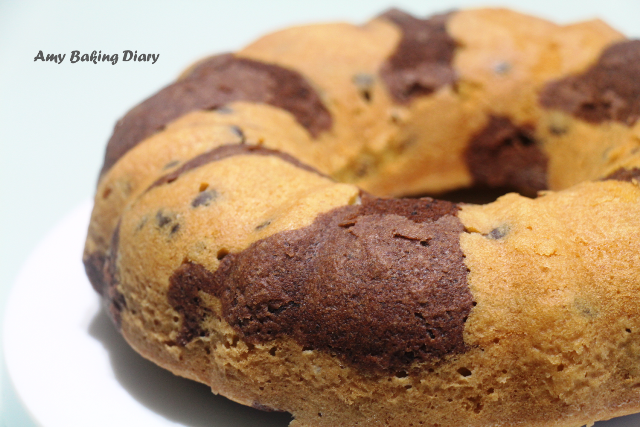 It is wonderful to have you baking along with us. And so glad to know you through Bake-Along. Thank you so much, Amy! Obrigada por partilhar sua sabedoria culinária!